This is a story about the picture that is header of my blog and a place that became my very favorite. While the significant part happened in 2004, I (or my family) did not have a digital camera yet at that point and so all photos linked here are from the 2016 hike. All photos are taken by me unless stated otherwise. 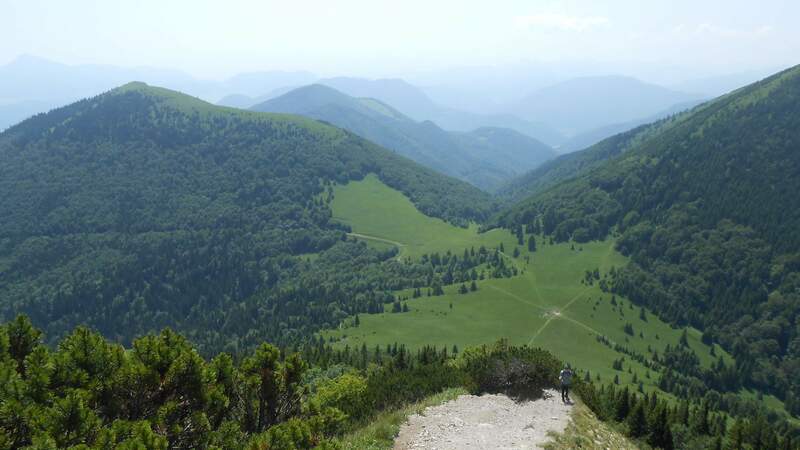 While Vel’ký Rozsutec is not the largest mountain in Slovakia by more than 1000 meters and with its 1610 meters of elevations is only 5th in the Malá Fatra mountain range, it¨s definitely one of the nicest peaks of Slovakia, if not the one. The dolomite mountain is striking from almost any distance and if the conditions allow, well visible from any nearby mountain ranges. The name ‘Rozsutec’ could be coming either from ‘rozsutý’ meaning ‘torn apart’ or the verb ‘rozsut se’ meaning to fall apart. Both are well possible when considering the landscape where the white dolomite rocks stick out of the terrain, randomly thrown around and the peak itself looks like something tried to break it. Something that this picture shows well. ‘Vel’ký’ meaning only that it’s larger of the two peaks, the smaller one can be seen in the background. So, now why this place became one of my favorite ones. Firstly, it was the first time I crossed the line of 1500 meters. Second, as mentioned, it was a peak that caught my attention from afar. 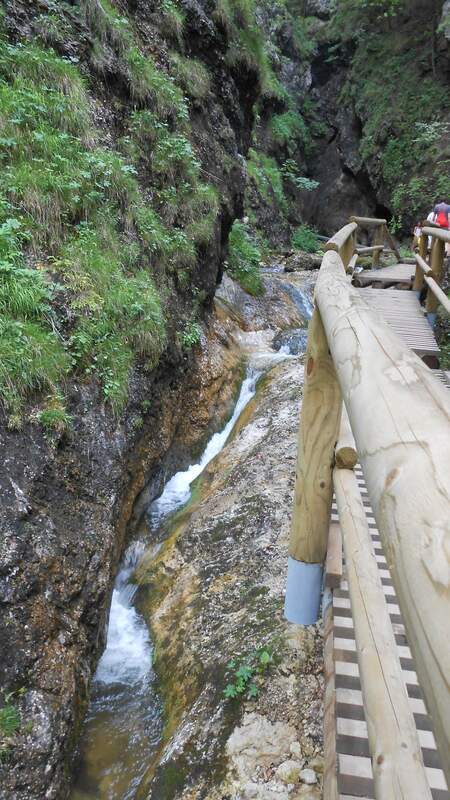 Thirdly, it was probably the hardest hike my 14-years old self did. It was almost as awfully hot as it is now that I am writing about it. Even though there was some time of walk straight to warm up while reaching one of the last group of houses in the valley, the path ascended quite sharply from there on. 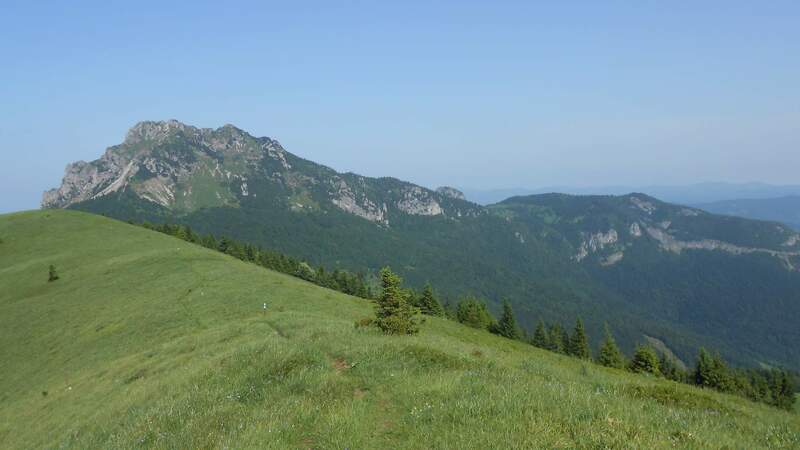 First through pastures with juniper shrubs, then through the typical Carpathian forests until reaching the fields in the pass below the peak. It was this view that made it stick in my mind forever. This hints the full picture. Once above the forest line, the mountain is a mosaic of grassy slopes, white rocks and shrub pines without any regular patters, as if just thrown around randomly. The ascension from pass is just 1,5 km long but getting from 1185 meters to 1610 on such short distance is not easy, especially if you get cloudless sky and the sun will do everything to fry you on the spot. In 2004, we had two liters of drink per person. It was far from enough. 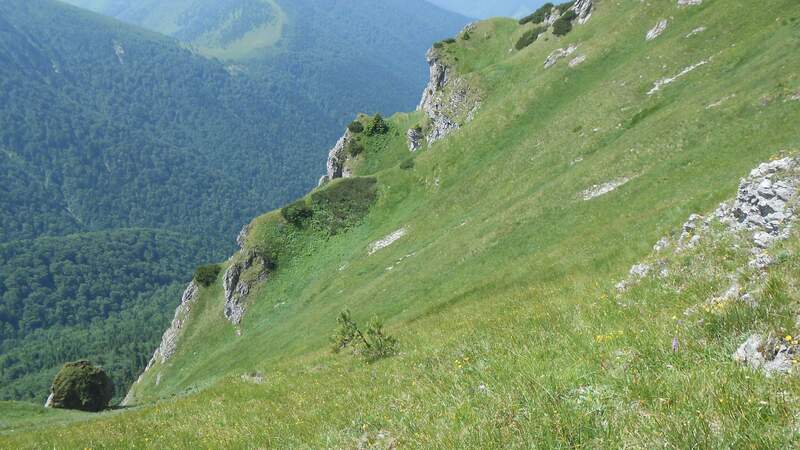 The steep ascent will give many opportunities to look around and take photos, something that everyone will gladly do because even half a minute break is welcome. Once leaving the short forested part, it turns into sharp ascent on rocky path and eventually just between the rocks, using chains bolted into the rock to help with progress. If there’s something that makes this place stand out, it’s the perfect elevation: above the forest line and below the altitude where nothing grows at all, which means alpine flowers can grow there. 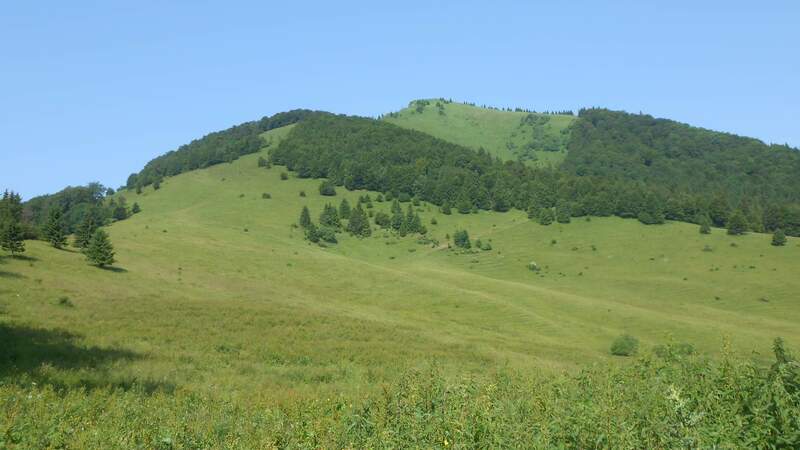 The nearby peaks that are slightly higher are nothing but grassy plains but this is mosaic of trees, shrubs and grasses. I admit that after reaching the other pass, I don’t remember much from the day apart from the searing heat and almost unending thirst. After retreating into the shade of forest, there was a bit less to see but the first impression remained. I started hoping for returning there some time after, but it was only in 2016 when that wish became reality. Of course it could not be without incident. As I was sitting in the bus, we were surprised by short hailstorm. Fortunately it was still some distance from there and moving in the opposite direction. By the time we reached the mountians, there were almost no traces of it and the sun was blazing at full strength again. Again, I would be feeling like being fried alive. I had five liters of juice to cool me down and spent all of it during the day. On the other hand, being older and more experienced, my approach took me over one more peak before Rozsutec itself. That alone was great despite the fact that after the short and quick rain the fields were a bit wet. It at least cooled me down, because it was already getting awfully hot and it was still something around 9:15. Of course, the moment I awaited came a bit later. From the peak of Osnica, I could finally see the peak of Rozsutec. And after almost 12 years, all I needed was to walk something over 3 km more. I was feeling quite emotional. Quite a lot. One of the pictures I took there was clipped to the header picture of this web/blog. At 11:40, the wait was over. Me at the peak. Photo taken by fellow hiker. I looked around a bit and stayed a while to refresh myself. I could not leave instantly. 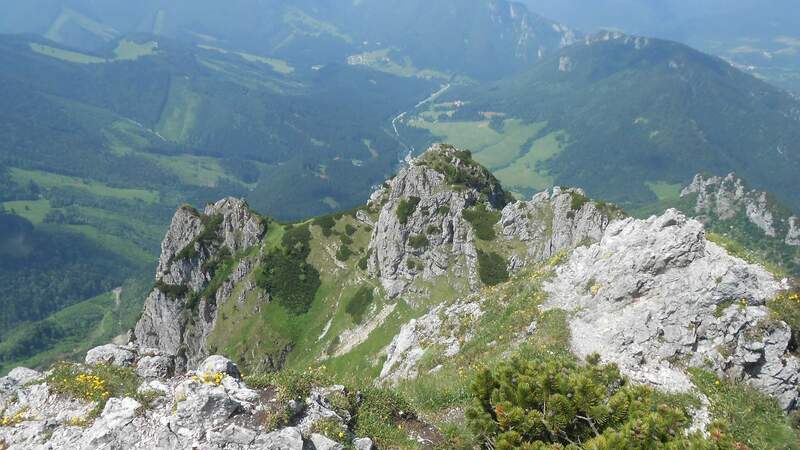 I could only enjoy the lower part because after three peaks and total of 1720 meters ascended, I had little strength left to go higher and I would probably not make it back in time. And lastly, another storm came and the descent back was quite soaked even though the first rain lasted barely twenty minutes. I did not care. I was so overheating that I did not even bother considering to use anything waterproof and worried more about what was inside of my backpack than about myself. Some people (especially kids) were hiding under a rock when that was possible while I continued with sunglasses on and my best terminator face. As long as the water was below the upper edge of my boots, I did not care about it. Best days of 2004 and 2016 respectively. 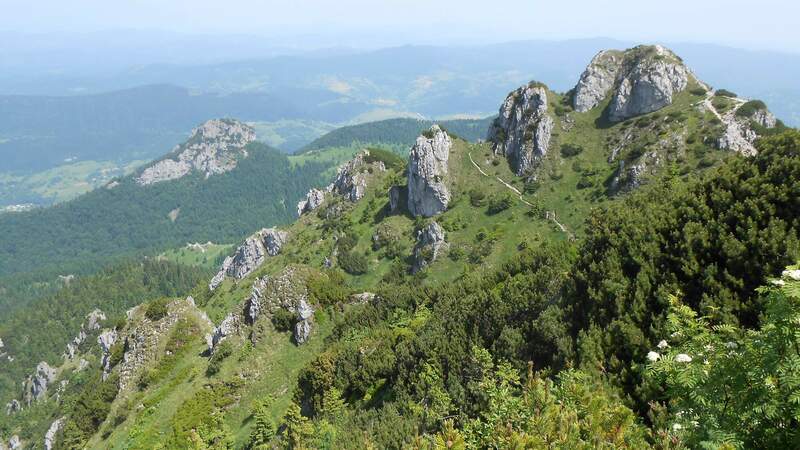 This entry was posted in Hiking, Slovakian mountains, Travelling and tagged Hiking, mountains, Slovakia. Bookmark the permalink.